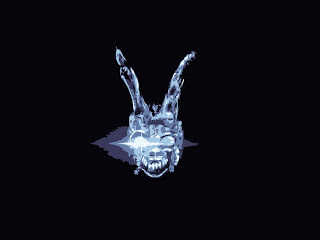 With an overtly detached plot, a complex and enigmatic climax and a storyline infused with emotional components and psychological individuality normally reserved for David Lynch productions, the Donnie Darko franchise has finally returned in the form of his sister. Despite receiving pallid reviews and a reception that was something other than temperate, S.Darko has finally been released and though I have yet to see the movie, I have realised how much of an impact the first film made on me. It was, at the time, passed over by many, but I was perhaps one of the few that felt it was an influential cinematic offering. It has gained pace over the years with most people having now heard of the movie, and DVD sales bringing it from obscurity into cult status. I drew this vector a while back, when I heard a sequel may be in the offing. I’m glad I did, its minimalism has warmed to me. As always, click to enlarge.